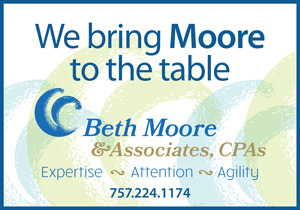 Marcus A. Jones has been promoted to senior associate with Beth Moore & Associates, CPAs. Previously serving as an associate, Jones has been with the accounting firm since 2017. Jones has both public and private accounting experience. Joining the firm is Christy Carver, CPA. Carver began her career with Eggleston, Smith, Hall, Cotman & Co. Formerly self-employed for 19 years, her focus with the firm is primarily on small business and individual tax returns. Joey Wallen, with Personal Training Associates, has successfully completed his studies and received his Advanced Certification as a senior fitness specialist (ACE). This qualifies Wallen to incorporate the modifications to prevent age-related muscle tissue loss, improve bone strength and balance. Jeffrey S. “Jeff” Johnson has been selected Newport News fire chief. He will be responsible for an annual operating budget of more than $34 million, 11 stations and a staff of 380. Formerly fire chief for Salinas, California, Johnson has more than 30 years of experience in EMS and fire service. He holds a bachelor’s degree in fire management from Columbia Southern University and a master’s degree in public administration from American Public University. Additionally, he has earned the Chief Fire Officer (CFO) certification from the Center for Public Safety Excellence as well as the National Fire Academy’s Executive Fire Officer (EFO) certification. 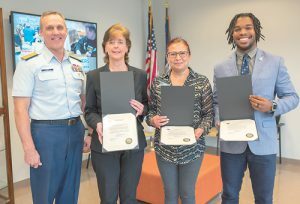 Rear Admiral Jim Heinz of the U. S. Coast Guard presented a personalized letter to Virginia Peninsula Foodbank staff members and their spouses who participated in the mobile pantry on the Coast Guard base in January. Shown here receiving the personalized letter from Heinz (far left) are Karen Joyner, CEO; Martha Inge, agency outreach coordinator; and Andrew Council, food sourcing manager. Absent from the photo were Katie Patrick, director of agency services and Renee Figurelle, chief operating officer. 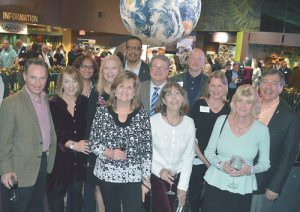 Participating and enjoying Virginia Living Museum’s 14th annual Bacchus Wine and Food Festival are representatives from Old Point National Bank, the event’s sponsor. Shown here are (front, left to right): Sharon Martin, Susan Daly and Sherri McQuillan; middle: Don Buckless, Martha Mugler, Lori Shuford, Rob Shuford, Jr., Kathy Witt and Joe Witt; and back: Renee Holloman, Thad Holloman and Ross Mugler. Langley Federal Credit Union (LFCU) reported its 2018 combined giving efforts of the credit union and the Langley for Families Foundation (LFF) at more than $871,000. These funds were invested back into the Hampton Roads community to more than 100 organizations that provide services ranging from healthcare, housing, homelessness, disaster relief and hunger. LFCU distributed $401,000 to 64 worthy causes. 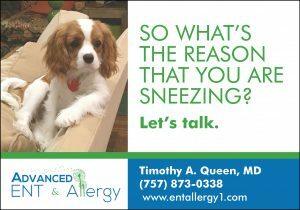 LFF distributed $470,000 through successful fundraising events and community initiatives. 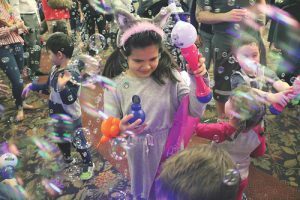 The majority of funds were raised through a premier golf tournament known as the Langley for Families Charity Golf Classic held last September. More than 125 Women United volunteers and guests converted thousands of dollars of groceries into meals for the hungry at the first-ever Women United Stone Soup event for United Way of the Virginia Peninsula. Volunteers prepared 400 casseroles and 400 brown bag lunches. The donated food, enough to feed more than 3,000 men, women and children, was distributed to 21 local nonprofit agencies. Steven S. Kast is president and CEO of United Way of the Virginia Peninsula. Fin Seafood restaurant was featured in the February/March issue of CoVaBiz magazine in the Meet and Eat Biz Report. Kenny Sloane is owner and executive chef of the Port Warwick restaurant. Old Point National Bank has selected both Digital Onboarding Inc. and ClickSWITCH, LLC to make it easier for people to switch their banking relationships to Old Point. Digital Onboarding, Inc. is a SaaS technology company, providing a fully automated new account activation platform, and ClickSWITCH is an award-winning technology that provides a secure digital solution for switching direct deposits and recurring payments. Jeff Belote and Ashley White have been inducted as new board members of the Boys & Girls Clubs of the Virginia Peninsula. Belote is a native to Newport News and started his own real estate appraisal business in 1991. He worked for the Boys Club in the late 70s, and joins as a second-generation board member. White opened her accounting firm, A.J. White & Associates, in 2010. She studied accounting at Christopher Newport University while working at Roy and Burns, P.C., and has passed the Enrolled Agent (EA) exam and CPA exam. 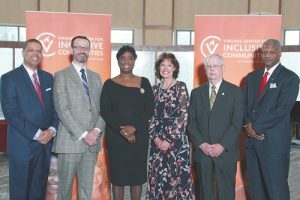 Recipients of the 2019 Virginia Center for Inclusive Communities (VCIC) Humanitarian Awards include (left to right) Jeffrey O. Smith, superintendent, Hampton Public Schools; Joshua M. David, attorney, David, Kamp & Frank, LLC; Alexis N. Swann, Peninsula market president and Hampton Roads business banking manager, Wells Fargo; Katherine S. Edwards, retired president and CEO, An Achievable Dream; Andrew T. “Tom” Olaisen, past executive director, Boys & Girls Club of the Virginia Peninsula; and Joseph Fernandes on behalf of One Hundred Black Men of America, Inc., Virginia Peninsula Chapter. PerkinElmer, Inc., a global leader committed to innovating for a healthier world, joined hands with the United Way of the Virginia Peninsula as PerkinElmer Diagnostics held its annual sales and service meeting in Williamsburg, continuing its tradition of including a corporate social responsibility event on the last day. Great Wolf Lodge was the meeting location, where the company created a memorable event for children with life-threatening illnesses and families of Edmarc, a nonprofit organization with programs designed to ease the trauma of a child’s illness or death and reduce the disability effects of pediatric illness, loss and bereavement on Hampton Roads families. More than 80 children, 60 adults and 130 PerkinElmer volunteers spent the day playing, laughing and creating lasting memories for the hospice children, siblings and parents. Hailey Chohany has joined Fear 2 Freedom as director of development and marketing and is responsible for overseeing donor relations, organizing fundraising efforts and implementing strategic marketing campaigns. Chohany began volunteering with Fear 2 Freedom in 2014 and became a board member in 2015. She has worked in hospitality, health services and creative arts sectors. Soundscapes was one of only five arts organizations in Virginia recognized with a Dominion Energy ArtStar Award for its innovative and collaborative approach to arts education. Dominion Energy Charitable Foundation presented a Shining Star award and a $10,000 grant to Soundscapes and other winners at the Art Works for Virginia Conference in Richmond in January. Soundscapes is a nonprofit organization providing free music education and instruments for at-risk and underserved students for two hours every weekday during the school year. It uses group music study and frequent performances as tools to instill self-esteem, concentration, curiosity and determination in some of the community’s most deserving students. Dr. Allen R. Jones, PT, DPT, CEO of Dominion Physical Therapy & Associates, has been elected chairman of the board of Health Professions for the Commonwealth of Virginia. TowneBank has been recognized with awards of excellence by Greenwich Associates, an independent financial consulting and research firm for the 13th consecutive year. For 2018, TowneBank was honored with eight Greenwich Excellence Awards, including a new category, Best Brand–Trust and Best Brand–Ease of Doing Business. Additionally, TowneBank’s performance was nationally recognized in Overall Satisfaction, Branch Satisfaction and Likelihood to Recommend. Southern Region Awards recognized the bank’s Overall Satisfaction, Likelihood to Recommend and Cash Management–Overall Satisfaction. Joe Dusewicz is manager of TowneBank’s Oyster Point branch. Peninsula Fine Arts Center will present a 54-minute documentary entitled Work at Hand, Michael K. Paxton, chronicling the life and work of painter Michael K. Paxton at 6:30 pm on April 25. The event is free and open to the public with a cash bar. For additional information, contact Peninsula Fine Arts Center at 757-596-8175 or visit www.pfac-va.org. Ron Lowder has joined the Goodrich & Watson Insurers, Inc. as an insurance sales agent. Top February agents for CENTURY 21 Nachman Realty’s Peninsula Office were Calvin Coleman, top listing agent; Chris Pray, top selling agent and top producing agent; and Carol Sobieski, top closing agent and top referring agent. Laney Morewitz and Wayne Edwards have been inducted into the Rotary Club of Newport News. Pictured at the induction ceremony are, left to right, Bo Hem, membership chair; Morewitz; Edwards; and Sharyn Fox, Edwards’ sponsor. Newport News Department of Public Works celebrated its inaugural Citizen Academy graduation. Thirteen participants embarked on a 10-week journey to learn firsthand about Newport News Public Works through a series of lectures, demonstrations, hands-on activities and field trips. The second class of the Public Works Citizen Academy is scheduled for the fall of 2019. To learn more, call 311 or visit the academy’s website. 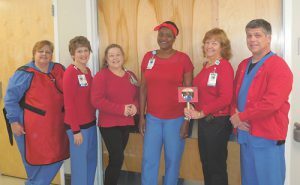 Recognizing Heart Month in February, the cardiac catheterization team at Bon Secours Mary Immaculate Hospital dressed in red to raised awareness of heart disease. Shown here are (left to right) Teresa Dail; Gina Thayer; Terrie Nelson; Gertha Jean-Baptiste, RN; Helene Drees; and Chris Foley. 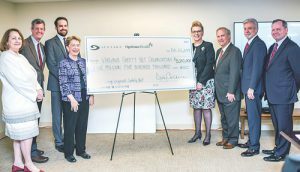 Sentara and Optima Health have donated $5.5 million, benefitting four non-profit organizations. Leaders from Virginia Community Healthcare Association, Virginia Association of Free and Charitable Clinics, Virginia Health Care Foundation and Federation of Virginia Food Banks, the recipient organizations, gathered for a check presentation event in Richmond in February. 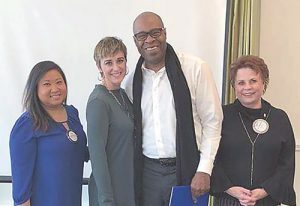 Pictured are (left to right) Dian Calderone, chair, Sentara board of directors; Dr. Daniel Carey, Virginia Secretary of Health and Human Resources; Edward Oliver, executive director, Federation of Virginia Food Banks; Deborah Oswalt, executive director, Virginia Health Care Foundation; Linda Wilkinson, CEO, Virginia Association of Free and Charitable Clinics; Howard Kern, president and CEO, Sentara Healthcare; Neal Graham, CEO, Virginia Community Healthcare Association; and Dennis Matheis, president, Optima Health.